The Outer Banks is a top destination for thousands of weddings a year. Some may ask “Why is the Outer Banks the ideal destination for the destination wedding?” Here are Sun Realty’s top 10 reasons to plan your wedding on the Outer Banks. 1. Your family and friends will love you for giving them an excuse to visit the Outer Banks! 2. It is within driving distance of major airports. 3. The drama of the natural coastal surroundings offers a gorgeous scenic backdrop to your big day. 6. It is beautiful year round! 7. You can have fresh local seafood at your wedding reception. 8. From mini-golf to hang gliding there is no limit to the fun activities you, your guest, and your bridal party can do leading up to and after the big day. 9. 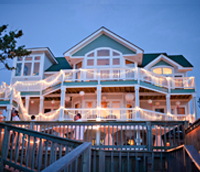 An Outer Banks wedding can be laid back or an upscale affair. 10. We aren’t the only ones who think that the Outer Banks is perfect for destination weddings. Over 3,000 weddings are held annually on the Outer Banks. Find out more on Outer Banks Weddings and Events here!